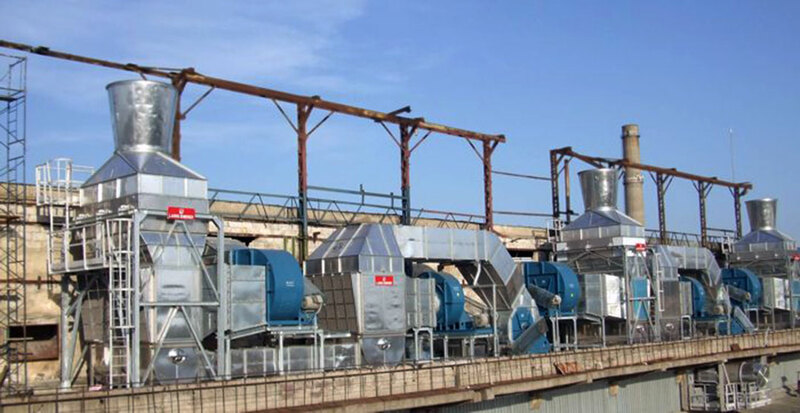 Paper machine drying section ventilation system and heat recovery system have the function to assure a proper air balance in the paper drying process. Consequently, ventilation system has to maintain the correct ratio between hood exhaust air and pocket ventilation blowing air. Evaporated water, produced by drying process, has to be removed by exhaust air system and expelled from hood to atmosphere, in order to avoid an increase of humidity with consequence of a reduction of evaporating capacity in the drying section. For these reasons, it has a key role in productivity and control of energy consumption of paper machine and it is one of the best way to establish the proper environment conditions for operators of machine room. Energy content of exhaust air from hood is a considerable quote of energetic balance in a paper mill and, if it is properly used, it is an instrument for reducing costs of production. 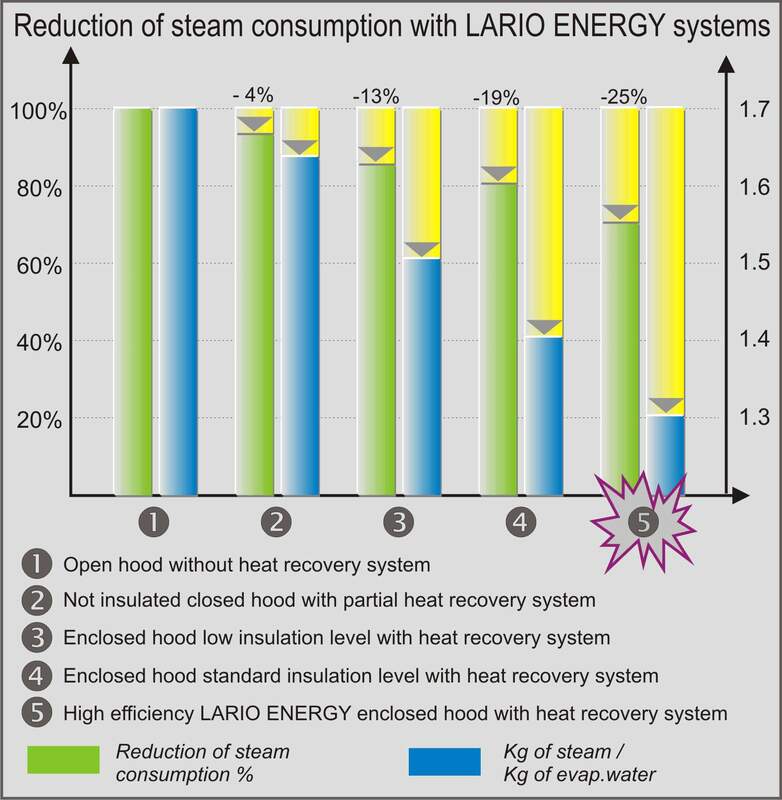 Lario Energy has developed a wide range of heat recovery units able to assure a short pay back of the investment. 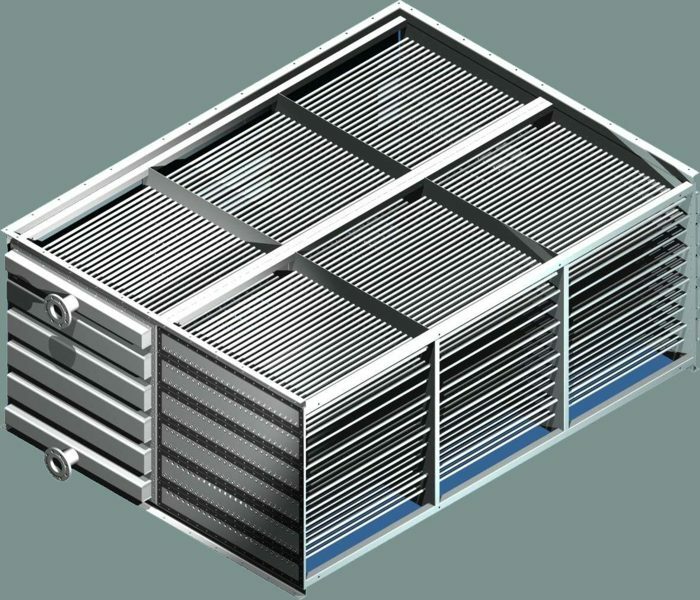 Air handling system, to reach the top of its performance, has to be integrated with a high efficiency insulated hood, so that exhaust air could reach a high energetic content (90°C-150 gr H20 / kg dry air), without influencing drying capacity of paper machine. It is also necessary to integrate air handling system with steam and condensate system, because it is possible to use the energy contained into warm condensate and re-evaporated steam, avoiding that they are sent to atmospheric vessels and wasted around. Furthermore, in the future, reduction of consumption is going to have a bigger impact in relation with the necessity to reduce emissions in atmosphere, allowing a financial saving and reducing Co2 quotes for industrial settlements. 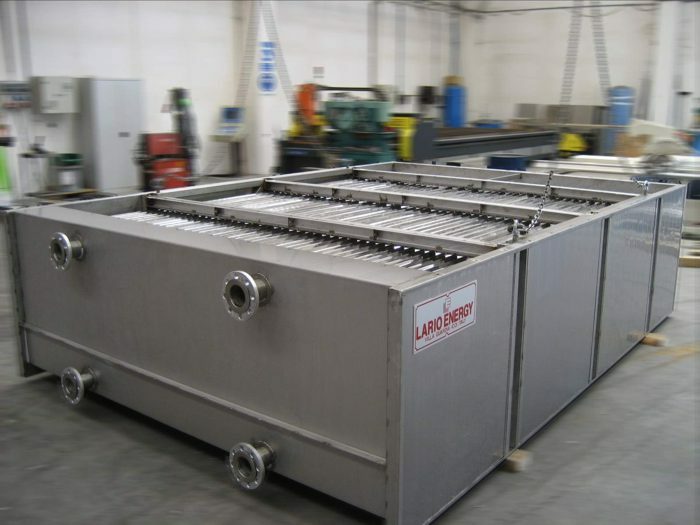 Lario Energy has developed a wide range of heat recovery units able to assure an high energetic efficiency and a short pay back of the investment. 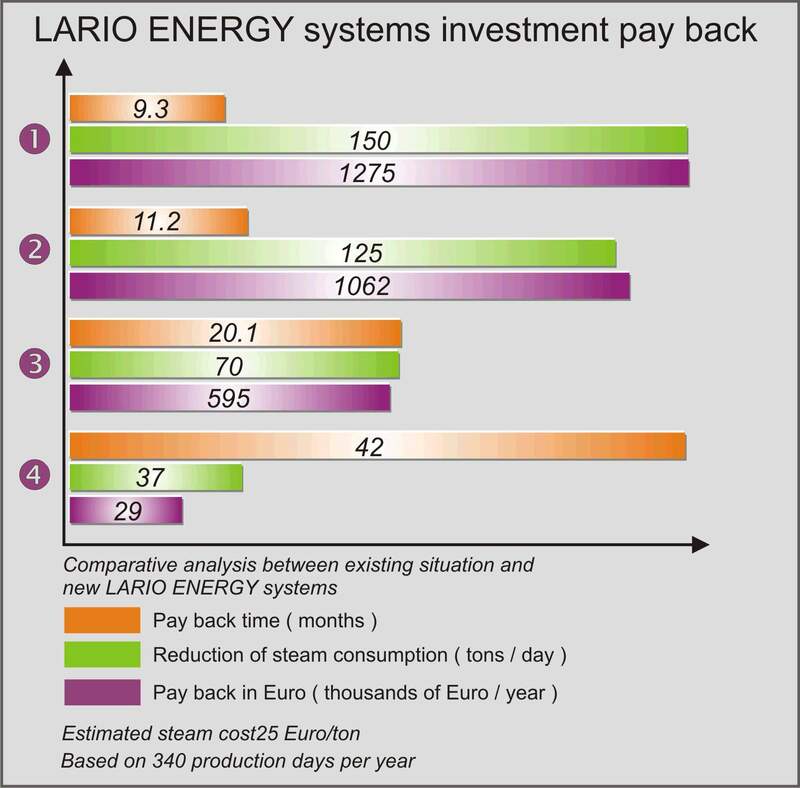 Our detailed technical analyses, survey of process and production data, the remarkable experience in a lot of successfully applications, allow to Lario Energy to supply a technical solution, key-on-board, with performance guarantees and estimation of investments pay back. The growing energetic cost and limits for emissions make investments in energy recovery systems a basic instrument to increase profitability of paper production. Also small size paper machine can have big advantages by a complete revamping of the heat recovery system. Energy saving obtainable with the new heat recovery units can arrive at 20-25% of the total steam consumption for paper drying with a very reduced pay back time. This is possible, above all, in case of paper machines equipped with old concept systems and heat recovery units with low performances. 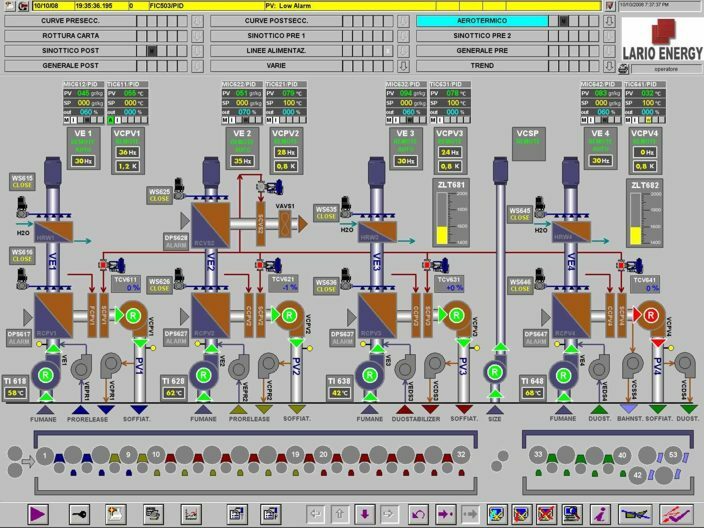 In fact, during the years, production of paper machine is often increased, but systems are not properly improved with the same pace and deterioration and damages of components compromise production efficiency. Air to water heat recovery units have been developed to increase and to facilitate the use of energy recovered from exhaust air . 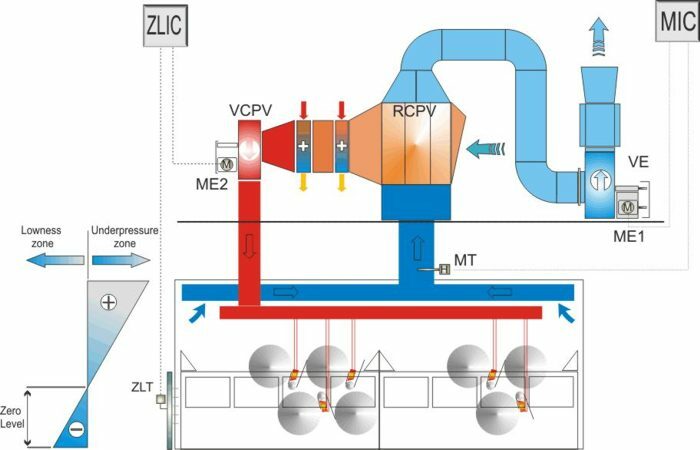 Heating of water, by using exhaust air flow, allows to reach an higher flexibility of heat transfer, thanks to the a simple hydraulic circuit instead of large size air ducting. Lario Energy have consequently studied a dedicated product, because the market does not offer anything able to match this application. Lario Energy takes a great care of heat recovery cleaning from exhaust air side to assure a perfect efficiency of automatic washing system and to allow an easy access for manual cleaning. Type HRHW uses stainless steel plates, manufactured through a pressure hydro-forming process: inside the plate, composed of two stainless steel sheets, there is hydraulic circuit where heated liquid flows. HRHW has low pressure drops on the exhaust air side and smooth surface able to reduce accumulation of dirt and dust. Plates can have different dimensions and can be connected to obtain different recovery configuration. Furthermore, this exchanger can be supplied with an external stainless steel insulation. The containing case and connections to air circuit are all stainless steel made. Air to air heat recovery units are the more frequently used for energy recovery from exhaust air. Exhaust air flows through circular pipes and transfers its energy to dry air passing outside the tubes themselves. This dry air is used for preheating of pocket ventilation or for paper machine building and false ceiling ventilation and heating. Exhaust air side can be easily cleaned from fiber accumulation because tubes are smooth. It is possible to equip air to air heat recovery units with an automatic washing system. Geometry of this kind of heat recovery system can be easily adapted do every plant, because it is based on a modular system and, thanks to this feature, it can be easily enlarged later. A reduction of energetic consumption, steam and electric power, can be easily obtained with a proper control of the different parameters of the hood and ventilation system. For this reason, it is important that hood and ventilation systems have all necessary automatic controls to carefully check every variable, always looking at energy saving. Essentially, quantity of extracted air from hood has to be function of evaporating load of drying section for different type of production. This correlation allows itself a heat and electricity saving, by reducing flow of air extracted by fans. Quantities of extracted and inlet air have to be automatically controlled by a process control system. HRPW heating up to 40°C of water for technological purposes, like spraying system, stock preparation etc. On the base of the data indicated on the principle diagram, is possible to see the energy saving obtainable by an exhaust air extraction system from an enclosed hood with an exhaust air flow of 100.000 kg/h. Il calore recuperato dai nostri sistemi permette il riscaldamento degli impianti di ventilazione della sala macchina e di altri ambienti. Un’attenta analisi dei flussi dell’aria e dei carichi termici interni permette di formulare soluzioni adeguate per ogni installazione, si ottiene così il corretto bilanciamento tra aria estratta e aria immessa nell’edificio per evitare flussi non controllati che portano alla formazione di condensazioni all’interno della sala macchina. Il controllo della temperatura e dell’umidità nella sala macchina sono necessari per il benessere degli operatori e la conservazione delle strutture e dei macchinari presenti nell’ambiente.